No one is on a diet right? Whew, I was worried for a second. Just remember, everything in moderation. Do not cut out whole food groups like carbs, fats etc. You will always go back to them. Always. It’s not realistic. But most importantly, keep your body moving and eat what you love. Alright, stepping off my soap box. First of all, let me just say, I love croissants. Love them. I can’t think of a better bread to eat by itself. You can make them into a sandwich, and so easily make them into dessert. I also adore chocolate, so when I saw this recipe, I became a bit verklempt, started shaking and knew I had to get hold of some croissants ASAP. I did, and all is now fine in my universe. However, the hubby and I might battle it out for the last piece, because this stuff is so dang good. It is exactly what you expect in a bread pudding, with lots of melty chocolate inside to put this dessert over the top. It’s so easy to make so there is no excuse why I can’t make it again soon. Like tomorrow. Right after I walk my five miles. This also makes an incredible brunch dessert. In a large bowl, whisk together the egg yolks, milk, cream, sugar, vanilla, salt and nutmeg. Add the croissants and chocolate and mix to combine. Transfer the mixture to a buttered, 8-inch square baking dish and bake in a 375 degree oven until a knife inserted in the middle comes out clean, 30-40 minutes (mine took 50). 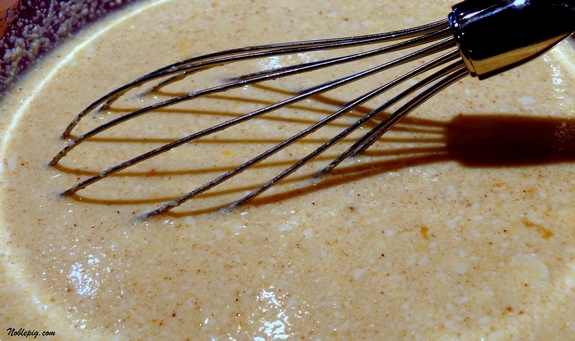 In a large bowl, whisk together the egg yolks, milk, cream, sugar, vanilla, salt and nutmeg. Add the croissants and chocolate and mix to combine. Transfer the mixture to a buttered, 8-inch square baking dish and bake in a 375 degree oven until a knife inserted in the middle comes out clean, 33-50 minutes (mine took 50). Croissants are food from the gods and make wonderful puddings. I’m sure this is amazing….after all, it has croissiants and chocolate in it! Yum! Cathy, Cathy, Cathy, my diet just went out the window, virtually of course. 🙂 Wow, that is a beautiful bread pudding. Yet another reason I should not read food blogs in the morning! 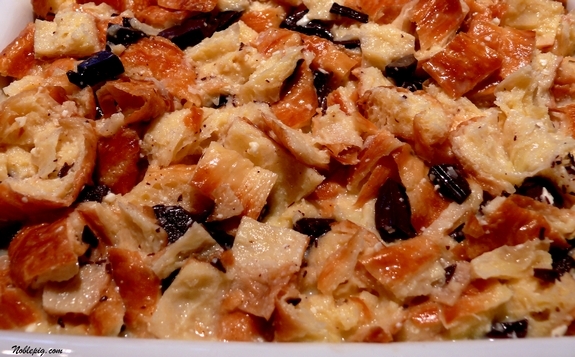 Now all I will think of is this insanely good looking bread pudding. Time to invite people for a brunch, I think. O- M- G!!! This looks amazing. 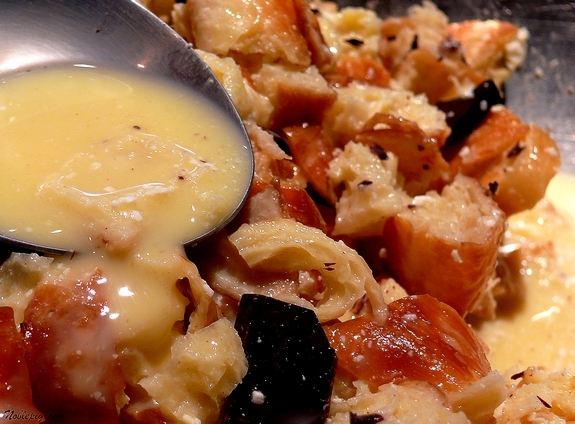 I made a bread pudding years ago and haven’t attempted it since. I think it’s still somewhere here on my hips..
Also intrigued to see how “verklempt” is spelled. I had no idea! Oh deliver me from evil, for this is unbelievably irresistible. Combining chocolate and croissants! That is wonderful! I’m right there on that soapbox with you and omg this looks amazing. This looks like a great dish as you said for a brunch. Will have to try out the croissants and chocolate. Yummy! oh god, have you ever had the chocolate croissants from traders joe’s? you have to keep them out of your house because you will eat a box full. and this recipe isn’t helping. 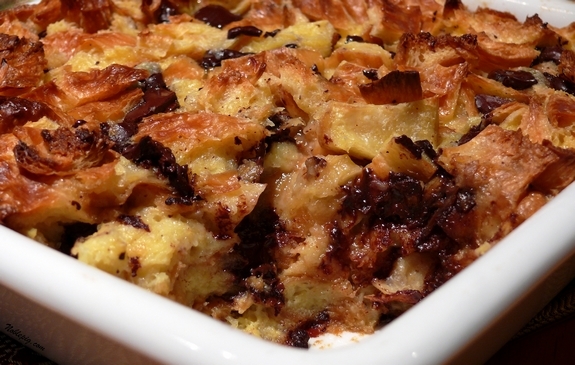 Bread pudding is one of my all-time favorite things! With the addition of chocolate I’m sure the hubby would be drooling twice as much as he does over normal bread pudding! As always, your photos are incredible! Oh my – that last shot with the oozing chocolate has me drooling. Beautiful Cathy. The pea soup down below looks amazing too. Perfect for this cold rainy day. no diet, LOL. hell no, I am a foodie! I made this once and truly the croissant gives it that great flavor. Good advice! You sure do tease with this one though. Darn – I’ll be making it to help chub up Dad! He’s gonna’ be so darn happy. Love it! 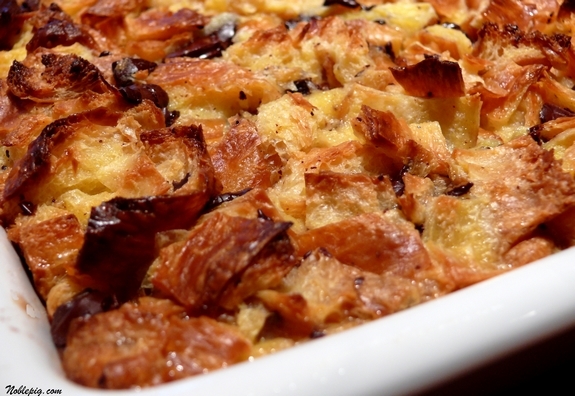 I recently made my first croissant bread pudding, it’s a good time. I’m in. Can’t wait to make this. The first time I had chocolate bread pudding (at Arcadia in nyc years/decades ago where they used brioche) I thought I’d died and went to heaven. I bet this is out of this world! You re a cruel, cruel woman. Healthier eating in the New Year is about balance. A few bites of this dessert would be just fine…and worth it! you are so mean!!! well…I’m supposed to stay away from baking for awhile, but…this is so hard to resist! This has my vote, ok 20 of my votes. Looks fantasic. Oh my, that’s some yummy looking stuff right there! I am rendered nearly speechless. oddly enough, croissants don’t really float my boat when they’re just plain. a surefire way to keep said boat from sinking is to toss in some heavy cream and loads of chocolate–YUM. 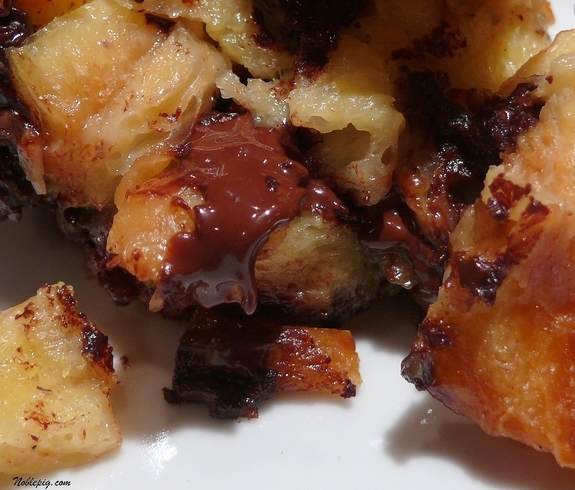 Love croissants, love chocolate, love bread pudding, love carbs, love fats, love this recipe. Yum! Oh good heavens to mergatroid…must have it with that melty chocolate. This looks SOOOO good, I have to look away! well, since all kinds of bread pudding are my desserts of choice, you know this is now on my list! After you professed your love of split pea soup yesterday I wondered if you’d gone off the deep end. I can’t STAND the stuff! But this looks delicious! I can’t wait to try it. This looks wonderful to me. How could it not be delicious with the ingredients you used. Very nice recipe! At the risk of sounding like a broken record: Lord. Have. Mercy. Yep, I will remain in my fat jeans. I made nary a food related resolution. My belated resolution is to try this. YUM! Mmmm…I say 5 miles is worth it! Made some bread pudding myself this weekend. Probably not as droolworthy as this luscious version. Oh. My. Word. You are evil incarnate. I must have some. I want to build a house of that stuff and eat my way out of it! Yes, I need some of this soon if not now. Croissants are going on the shopping list. Incredible! The thing about desserts is not to avoid them but to make sure the ones you do eat are worth it. I’d guess this qualifies. i’m scaring myself, but having made chocolate bread pudding before i think this would also be good with nutella substituting the chocolate. I live in France and you’ve just shown me what to do with day old croissants! Fabulous! I’m in the middle of an icepocalypse in Oklahoma, and I just made this to keep myself busy. Best. Choice. Ever. This is friggin’ delicious. Unfortunately, since all the roads are closed, none of my friends can come over and enjoy it. I suppose I’ll have to eat it all myself. Ho humm… What a hard life. Don’t you know that it is high time to get the mortgage loans, which would make your dreams come true. Made this last night, and holy mother of god it’s RICH. Very yummy, but a little goes a long way. I’m thinking next time I’ll do 2% milk instead of the whole, maybe half & half instead of cream. It kind of sat in my stomach like a brick last night. i make this recipe all the time. it’s a definite winner. yours looks fantastic! Do you have a nutritional value for this recipe? This looks great! Can it be made ahead and reheated? Best when served right away. Not supposed to be looking at this while at work – can’t help myself but how do I explain drooling all over my computer? This sounds amazing…but would I be able to make it dairy free, using stiff coconut milk for the cream and maybe almond or cashew milk instead of real milk??? I wish I knew for sure, let me know, if you try it. Can I put this together the night before and then bake the next day? Hmmm. I have never tried that. The chocolate will seize up so I’m not sure.